As a parliamentary librarian, Missingham, chronicles the development of Electronic Resources Australia (ERA) as a collaborative and coordinated effort addressing the availability of quality information sources and content without allocated funding. The role of public libraries is defined as being integral in the provision of services, quality information, providing skills development in information literacy, improving access and participation in the digital environment. The participation in the digital economy and environments is linked to active citizenship. Missingham highlights this as linked to principles of the Australian Government 2.0 taskforce launched 2009. By inference, Missinham identifies a divide between rural and metropolitan regions. The National Broadband Network, (NBN) presents the promise of bridging the divide with the expansion of information infrastructure backed by $43billion of Government funding. No funding has been allocated for information as relevant content, skills development, equitable access in public spaces and training required for information literacy. Missingham outlines the case for improved services and access to information pointing to a correlation between improved literacy outcomes with participation in digital environments. ERA launched in 2007 after consensus on the model was reached by a representative group of Libraries, Education, Health and Government Associations. ERA delivers digital content based on an opt-in subscription model sponsored by the National Library of Australia. At the time the article was written 8.5 million Australians had access to information provided by ERA. Missingham identifies issues and barriers encapsulated in the three areas of connectivity, content and capacity and recommends a Federal coordinated effort including committed Government funding for content creation and preservation efforts, skills development, training and improved accessibility. Missingham’s background in the library sector and extensive publications on digital environments adds credibility to her viewpoints. This paper, contributes to the evidence-based practice necessitated to channel support from the Government as is evident at a micro level with school libraries, (Todd, 2007) and Oberg (2006). Acknowledgement is paid to the limitations of this paper as its main purpose is to chronicle the development of ERA, bringing focus to the need for development of relevant digital content, skills, and equitable access for participation in the Digital environment whilst advocating for funding. A key weakness is limiting the digital divide to a rural/metropolitan divide. Minimal attention is paid to socio-economic aspects with nothing mentioned of disparity between indigenous Australians and non-indigenous Australians as evidenced in remote communities in Central Australia, (Rennie et.al, 2010). Schleife (2009) points to individual determinants, such as education level, contributing to increased internet use in regional areas of Germany also supported by La Rose, et.al. (2007) in complexities of internet adoption in regional U.S.A. Hutley (2011) echoes Missingham but makes a point of extending the definition of digital divide to take account of socio-economic indicators, highlighting the existence of a digital divide in metropolitan areas. Unesco (p. 30, 2005) points to the digital divide as multifaceted and not a simple binary delineation between rural and metropolitan regions. Metaphors such as ‘super highway’ help to channel support for governments in building the information infrastructure, Borgman (2000). Missingham alludes to these metaphors at the outset of her paper, however, her arguments strengthen in aligning the importance of the NBN with content, skills, accessibility and training, also supported by Unesco (2005). Hutley (2011) calls for a move away from the focus on the infrastructure and supports Missingham’s call for committed funding to ‘soft’ elements; content creation, skills development, access and training; noting that libraries are yet to be connected to the NBN. Evidenced in this paper is the interplay between technology, policy and society in coming to grips with the challenges presented by the information Age, (Borgman, 2000), (Unesco, 2005) and (La Rose, et.al. 2007). The NBN is about open access, capacity and connectivity as well as a policy response to the restrictive trade practices of Telstra, (Mulligan and Neal, 2009) and (Morgan, 2010). It is yet to be seen whether the NBN will lead to adoption of broadband in homes and whether the most disadvantaged will be able to afford it, as questioned by Hutley (2011). The U.S.A experience indicates that adoption rates have remained low in rural areas and a significant divide continues to exist (La Rose, et.al 2007) and (Malecki, 2003). This paper is an effective starting point to the important issues of access, participation, content creation, preservation and digital citizenship with a focus on the importance of libraries. It indicates a collaborative sector determined to contribute to the betterment of all people. The following clip provides an indication of some of the work carried out by National film and Sound Archive. One of the branches carrying out the wonderful curation and content creation work in Australia. Hutley, S. (2011) Where’s the strategy?, Incite, 32(1), 13-14. La Rose, R., Greg, J.L., Strover, S., Straubhaar, J., &amp; Carpenter, S. (2007), Closing the rural broadband gap: Promoting adoption of the internet in rural America, Telecommunications Policy, 31, 359-373. Malecki, E.J. (2003), Digital Development in rural areas: potentials and pitfalls, Journal of Rural Studies, 19, 201-204. Morgan, K. (2010), Hollow Victory, Dissent, No. 33, 55-57. Mulligan, P. and Neal, C., (2009), National Broadband Network to impact more than just internet speeds, Law Society Journal, 46(7), 34-35. Rennie, E., Crouch, A., Thomas, J. &amp; Taylor, P. (2010) Beyond Public Access? Reconsidering Broadband for Remote Indigenous communities, Communications, Politics &amp; Culture, 43(1), 48-69. Schleife, K. (2009), What really matters: Regional versus individual determinants of the digital divide in Germany, Research Policy, 39, 173-185. Specialist, ch. 4, pp. 57-78, Westport, Conneticut, Libraries Unlimited. The Future is Now ~ Are you ready for a Library 2.0? The concept of ‘Web’ takes prominence today in how we view information and links to information. This is an important visualisation to ponder as it is this particular visual that holds the key to our future and present as an information society. The metaphor of the web and its importance in conceptualising and realisation of networked information societies continues. 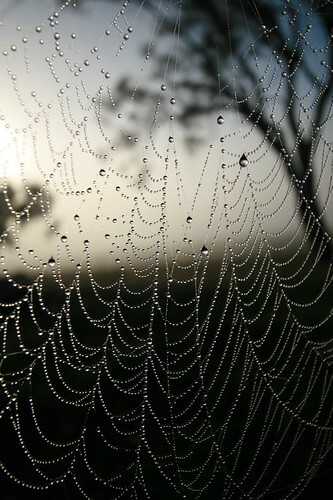 A web as a visual, not only represents network links and strength but acts as a metaphor for a basic Web 2.0 principle of harnessing collective intelligence thereby strengthening the overall web. O’Reilly (2005) points out that as the web works via hyperlinking, the addition of new content and new sites by more users provides the basis for the strengthening of the web. This is because as other users link to content via discovery the links bind and strengthen and hence the overall structure is strengthened. Not unlike how synapses in a brain strengthen with repeated associations (O’Reilly, 2005). In imagining a future, I want to start in the past of future imagining. The following clip is an example. This clip is part of a long line of what can be termed ‘futurists’, Coyle (2006). Another work of significance that I have recently discovered is Bush(1945), ‘As we may think’. In this work the conception of the ‘memex’ and the vision of a hyperlinked and networked future is inspired by the workings of the mind in its ability of moving by association through information; not unlike O’Reilly (2005) linking of the Web to concepts of association strengthening the synapses in the brain. Tim Berners-Lee the inventor of the World Wide Web and html (Hypertext Markup Language) is a further extension and development of this initial ‘futurist’ vision by Bush (1945). Here is the clip where Berners-Lee discusses the history and his vision of the Web. In the context of Web 2.0 as something more than technological tools, examining what Library 2.0 is becomes pertinent. Anderson (2007) contends that libraries have been too focused on the user and the use of technological tools as being what Library 2.0 is. Hence missing some key philosophical principles of Web 2.0. In the myriad of information out there about Library 2.0 and as an extension Librarian 2.0, I would have to agree that the definition is not clear enough and there does appear to be a disproportionate focus on technological tools. Library 2.0 is not just about the technological tools it is much more and the philosophical principals and design principals of Web 2.0 as outlined by O’Reilly (2005) are worth exploring in detail and translating to a library 2.0. Casey (2006) travels part way to the principles outlined by O’Reilly(2005) and it is the principle of the ‘long tail, even if it is user focused, that captures concepts of diverse representations as embodied in community cultural development practices. This is of prime importance when considering the principle of harnessing collective intelligence. The following slideshare provides a good understanding and explanation of Web 2.0 as applicable to Library 2.0. Last week and for quite some time I have been discussing my dream of what a library means now and in the future. How would I create my ideal library service? What will it include and what can it contribute? By drawing on Web 2.0 as a philosophy, rather than a set of web technology tools, I want to translate this philosophical vision as a possible take on Library 2.0. This is not an all encompassing Library 2.0 but something that can contribute quite significantly. It is further grounded in principles of community cultural development. Within this structure the Library 2.0 acts as the nexus, platform or service that brings everything together. It connects community, specialists and resources and contributes to the shaping of the now and future of a unique community repository of information. This happens alongside many of the traditional functions of a library service. However, this Library 2.0 is now participating in the creation, storage and dissemination of information similar to the concept of a Commons Based Peer Production as outlined by Krowne (2003). Furthermore, the Library 2.0 is a node in a wider network of Library 2.0 services participating in similar community building of unique information repositories. This then feeds into a larger central repository of National Archives Australia and beyond. I take as a given that we are living with various technological tools that we are connected to and utilise to make connections, source information and for various other purposes in life. I also accept it is a given that technological tools will be part of our work, life and play. Therefore, as a part of the larger society and world, the Library 2.0 will also be connected and utilising the various technological tools at our disposal. However, it is not the tools that define this philosophy of Library 2.0. Rather, it is how we work and integrate them in our life that is the important aspect. It is this aspect that remains the focus of my Library 2.0 in understanding what benefit they contribute to this vision. Web as a platform transforms to Library as a platform in my vision. The Library becomes the microcosm of the larger workings of interconnected information. The library is the platform upon which the links are made and expanded upon as more and more users connect to services and contribute to services. The Web as a platform is a service providing links and strengthening associations and as an extension the Library 2.0 is this very same thing. It is a service providing the associations relevant to the specific communities it serves. Every library 2.0 will have its individual contributions based on the community that it serves and connects. No communities are alike they are all different and have their own contributions to make. This is the key. At the same time, all libraries are connected in the overall Web platform and share their unique contributions thereby contributing a diversity of voice, ideas and experience as drawn from the contributions of unique individual communities. This is community building and connectedness. This enables diverse representation in a way that we have not seen before. As a public and civic space the library is the perfect platform for community to connect and contribute to the growth of the community, continuing conversations and sharing information. Library as contributing to community history preservation and building. Library as a node on the web acting as the web itself within its community in the platform it creates. To illustrate this Library 2.0 I will provide an example of how I see it working in the wider Web 2.0 world. Coming from a community arts background, it is the lack of documentation and archiving of projects that inspires me in the Library 2.0 being a platform to enable this. A few years back where I worked on many grass roots arts projects with various and diverse communities, I was struck at how few of these projects are documented effectively. As a result, a youth theatre project ends with the performance and not much else beyond that. Nothing is stored as an archive for others to access and enjoy or possibly learn from. If there is an attempt at documentation, it may consist of copies of the script and possibly a video recording existing either in archive boxes at the youth theatre or tucked away in someone’s home. Projects from the 1980’s may exist on a VHS tape or a beta tape and the possibility of viewing is fast diminishing. Theatre is only one example, there are oral history community projects, film projects, writing projects, music projects, photographs and the list continues. These projects occur throughout Australia and the world. They are about connecting communities, artists, audiences and sharing information. They are about providing access and voice as well as representation and yet there aren’t any definite practices in place to connect the outcomes and disseminate with wider communities and audiences. In my Library 2.0 the library becomes a place where such projects can occur. Linking communities with writers for community writing projects by providing the space and resources for this to occur. Beyond this my Library 2.0 takes this unique data created by the projects of the community and feeds it into our repository to be shared now and into the future. As an example, an oral story project with new arrivals (as the community) can be created with a community arts workers facilitating the project. The Library 2.0 provides the space for the communities to connect and carry out the project. Utilising the tools in the library the stories can be recorded, edited and stored for access and sharing. Thereby, a unique community repository of information that is shared and owned by the community that created it. Audacity is a free program and very simple to use that can enable this. The Librarian does not have to even know how to use this software program. Instead, it is possible to connect with artsworkers who have the skills and as a result the library facilitates the connections and provides access to the resources to enable the process. Clearly, many library services are already on this path. The State Library of Victoria has the Wheeler Centre next door linking the library with resources of writing. City Library has an art gallery space providing access to artists to share their work as well as a piano for use by the public. However, it is taking the next step and moving into creation of community repositories that my Library 2.0 will really come into being. It is creating the spaces and means to store, share and disseminate this unique community data and information that I can see being the move in the Web 2.0 wider world. No Shelf Required published the following blogpost on August 8th, titled enhanced ebook and portal books-Publisher/library partnerships delving into the concept of the library as the platform in the creation of and contribution to an archival repository via collaborative links. Library 2.0 as a node in the wider Web 2.0 world helps to build communities and provides access to diverse groups to share their stories and build upon the wealth of the world. The ideas are here and the Future is Now!